Package includes: Model No. 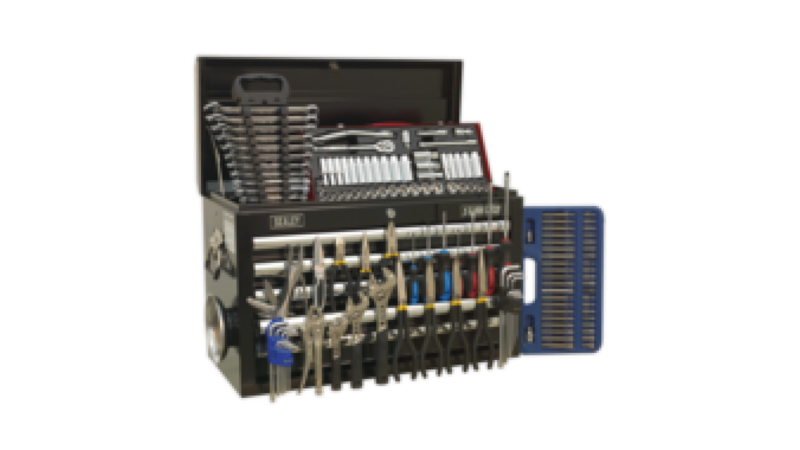 AP33059B Topchest 5 Drawer with Ball Bearing Slides - Black Overall Size (W x D x H): 660 x 315 x 425mm 138pc Tool Kit Model No. - Description AK219 - TRX-Star/Spline/Hex Bit Set 42pc 3/8" & 1/2"Sq Drive AK231 - Magnetic Collector Ø150mm AK5040 - Screwdriver Set 7pc PowerMAX® AK63012 - Combination Spanner Set 12pc Metric AK6820 - Locking Pliers Curved Jaws 180mm 0-35mm Capacity AK692 - Socket Set 45pc 3/8"Sq Drive 6pt WallDrive® - DuoMetric® AK7137 - Hex Key Set 9pc Extra-Long Metric AK7162 - Security TRX-Star* Key Set 9pc Long AK9452 - Adjustable Wrench 200mm AK9451 - Adjustable Wrench 150mm AK9453 - Adjustable Wrench 250mm AK930 - Needle Nose Pliers Set 3pc 280mm Ni-Fe Finish AK9333 - Pliers Set 3pc Ni-Fe Finish AK935 - Needle Nose Pliers 280mm Offset Ni-Fe Finish PK1 - Pocket Knife Locking PK10 - Multi-Tool 10 Function Other products of equivalent value will be supplied in the event that the promotion items should cease to be available. You may also refer to the individual Model No. for full specification.